If you're a subscriber to GameInformer magazine, you have most likely received a wonderful little present in the mail this month, in the form of confirmation of Guitar Hero: World Tour, or "the game previously known as Guitar Hero 4." Unsurprisingly, this newest iteration of the immensely popular Guitar Hero franchise will feature a Rock Band emulation engine drums and vocals as well as the traditional guitar and bass. In addition to the full band confirmation that we all saw coming, Activision also let GameInformer know about a couple exclusive bits of info, like the inclusion of a create-a-song mode in the game, a drum kit with cymbals, and fully customizable characters. In create-a-song mode (Activision called it "Studio Mode"), players will be able to choose a scale, record music, and send it to others online in a YouTube-esque social networking system that comes built in with the game. 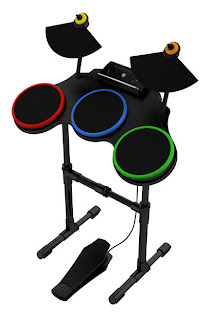 The drum kit looks suspiciously similar to Rock Band's, albeit comes with only three drum pads, has two cymbal pads, and will presumably be more durable than its competitor's. Finally, to the glee of many Rock Band-ers and Guitar Heroes, all of the instruments will be wireless. Another big part of this game will be downloadable content, as Activision will be releasing new songs more frequently, possibly even weekly. Plus, Activision Blizzard's music library will quickly match MTV Games' thanks to owner Vivendi Universal's huge music label. Finally, the folks at Activision have announced that Guitar Hero: World Tour for the Wii will, in fact, have downloadable content. Some confirmed artists are The Eagles, Linkin Park, Sublime, and Van Halen, hopefully a sign that Guitar Hero will be moving away from its metal-centric roots toward more varied types of music. There are also a couple of strange statements that have been thrown around about the game, including the promise of "local content" from "local bands" (possibly referring to small-time indy bands?). The game will release this fall on Playstation 2, Playstation 3, Wii, and Xbox 360. 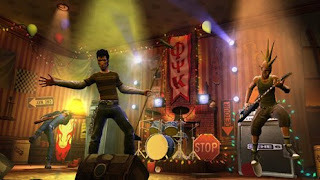 I have my doubts that World Tour can size up to Harmonix's Rock Band, but who knows? Perhaps Neversoft can drag Guitar Hero out of the inferior position it has occupied after the release of Guitar Hero III. If it's cheaper than Rock Band, I can guarantee that it will be dragging my money out of its inferior position in my wallet.